Views of the rooftop park. “This is one of the most beautiful garages in the world,” Steven Plate said about the 25-foot-high structure that leads into and out of the underground vehicle security center at the World Trade Center. Mr. Plate has an interest in saying so, since he is the chief of major capital projects at the Port Authority of New York and New Jersey, which is redeveloping the trade center site. But he also has a point. Offhand, it is hard to imagine another garage in New York City with 19 planters on a publicly accessible roof, many with recycled teak seating set into their sharply angled concrete walls; a 336-foot-long vertical garden planted with a half-dozen species; a panoramic view of the National September 11 Memorial; a sapling propagated from the horse chestnut tree that Anne Frank could see outside her window in Amsterdam; and a Greek Orthodox shrine designed by Santiago Calatrava. Taken together, these features are called Liberty Park. 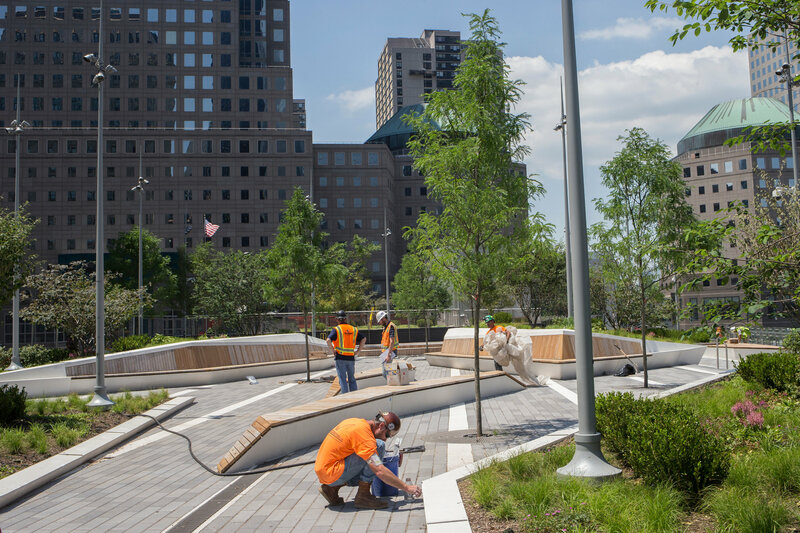 The one-acre, $50 million park, elevated on Liberty Street, is to be dedicated on Wednesday. After that, it will be open to the public from 6 a.m. to 11 p.m. every day, said Glenn P. Guzi, a program director at the Port Authority. It is sure to become a popular destination, particularly when a half-dozen young honey locusts and other trees mature into a dappled canopy over an exposed, hard-edged expanse. 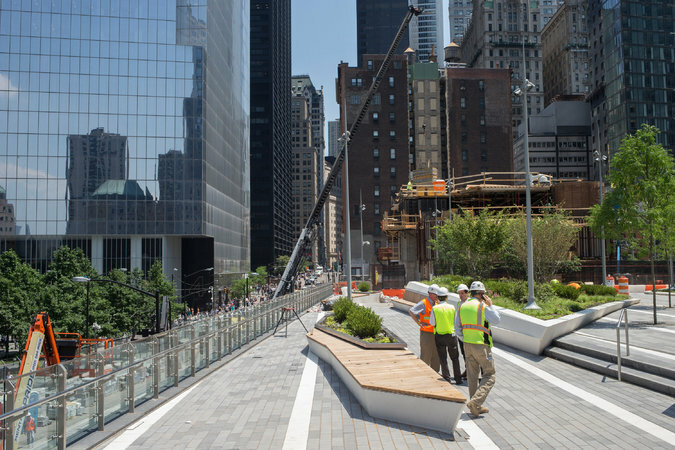 Along Greenwich Street, the park affords the best people-watching spot in Lower Manhattan: a cascade of tiered teak seating reminiscent of the TKTS staircase north of Times Square or even, in a modest and more comfortable way, the steps at the Metropolitan Museum of Art. The elevated park can also be reached by gently inclined ramps. Look closely and you will even find touches of whimsy, not a characteristic that springs to mind when talking about the Port Authority. 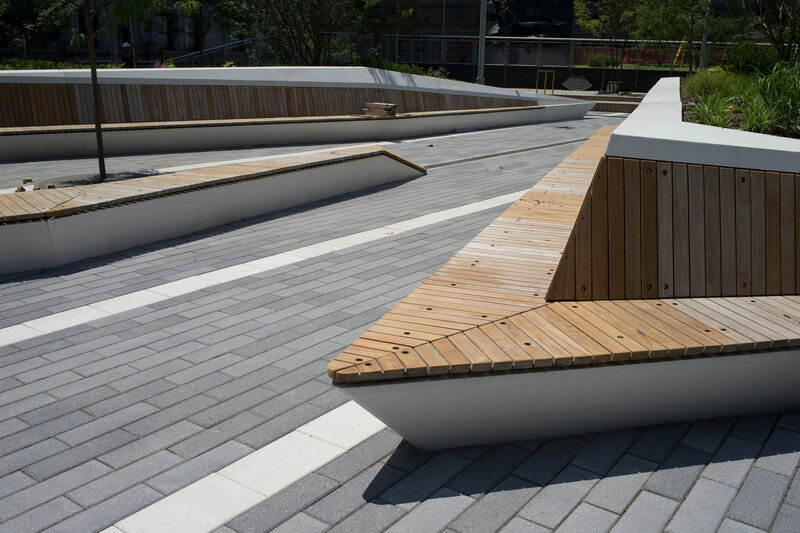 Some of the teak seating around the planters tapers down to planks only a few inches tall — as if they had been set aside for the comfort of visiting hamsters. The design is by Joseph E. Brown, a landscape architect and the former chief innovation officer at Aecom, a giant architectural and engineering company. 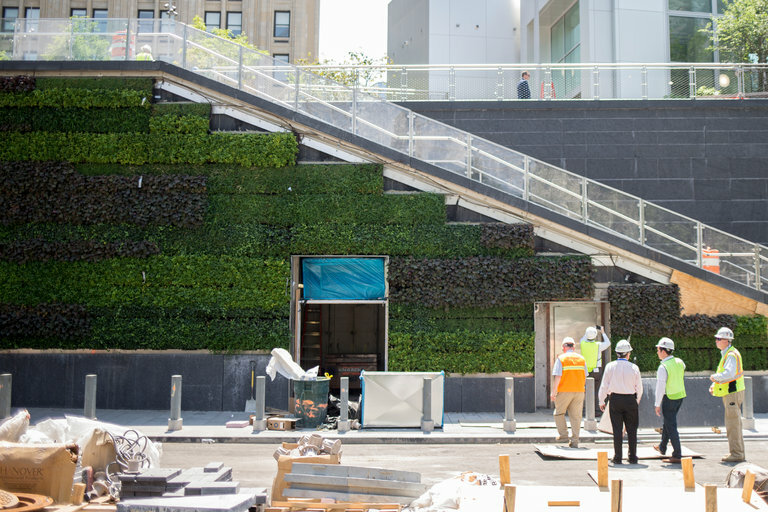 The most unusual feature of Mr. Brown’s design is a vertical garden along Liberty Street. It wraps around the bays where trucks are cleared to serve the buildings of the trade center along a network of underground roadways and loading docks. 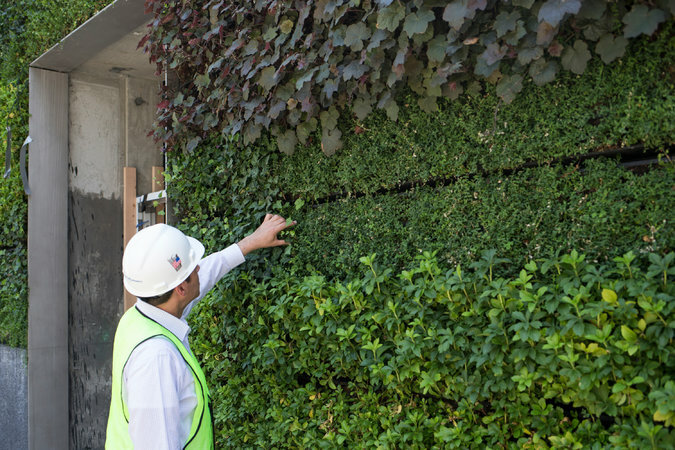 This “living wall,” by Plant Connection of Riverhead, N.Y., is composed of 826 panels filled with goldenstar, Baltic ivy, Japanese spurge, common periwinkle, coral bells and winter creeper, forming broad bands of color. The panels are cultivated in a horizontal position at the nursery, then shifted upright as the plants’ roots become anchored to the soil and the panels’ structure. Irrigation tubes punctured with tiny weep holes snake among the panels to keep the plants watered. 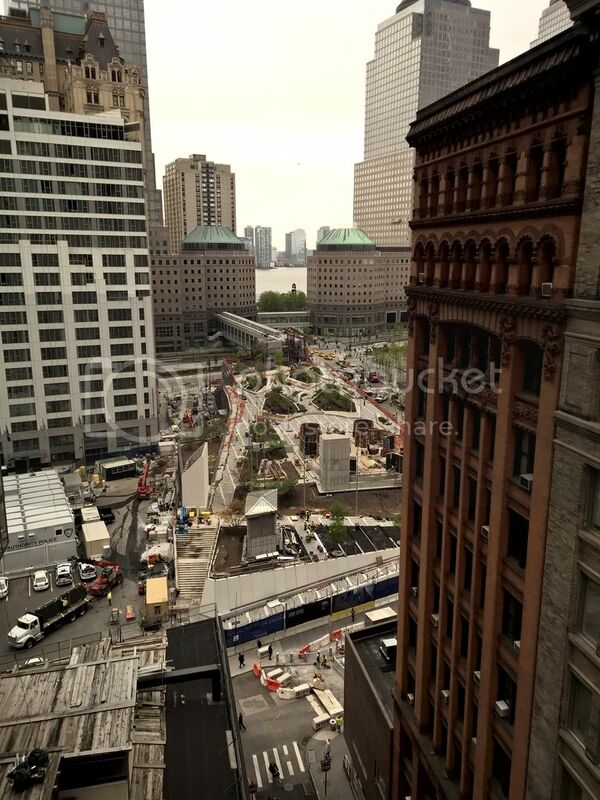 The park project was intended partly to compensate the residential neighborhood south of the trade center for the 15 years of construction, disruption, dislocation and trauma it has suffered since the terrorist attack of Sept. 11, 2001. “We wanted to give a gift back to the community,” Mr. Plate said. The elevated park serves as a setting for the St. Nicholas National Shrine, designed by Mr. Calatrava, which is now starting to assume recognizable form in concrete. It is also the new location of the “America’s Response Monument,” a sculpture by Douwe Blumberg of one of the Special Forces soldiers on horseback in the early years of the war in Afghanistan. “America’s Response Monument,” subtitled “De Oppresso Liber,” a motto of the Special Forces, has been treated far more deferentially in recent years than Fritz Koenig’s “Sphere,” a sculpture that actually stood in the original World Trade Center plaza and survived the 2001 attack — symbolizing both loss and resilience. 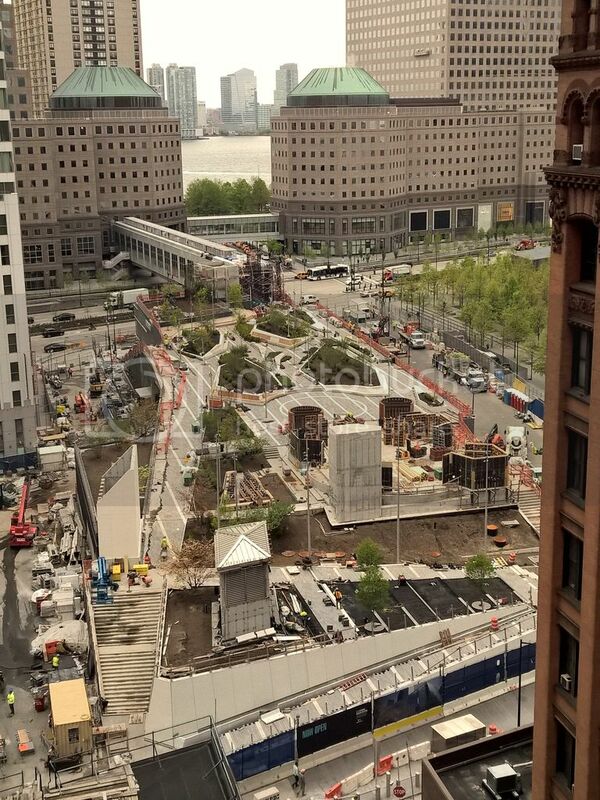 Mr. Koenig’s work was all but banished to Battery Park by Mayor Michael R. Bloomberg. So, I guess the northern portion of the VSC is taking a break?